Everybody loves when the bowl season comes around, and this will be the last time the bowl picture will look as is with the end of the BCS looming, the rise of the College Football Playoff, and even more bowls! Therefore, here are my predictions for all 35 bowl games, including that much anticipated bout between Florida State and Auburn for all the marbles in Pasadena on January 6th. Jim McElwain has done a good job in Fort Collins but the key concern I have is with their less than stellar defense, especially when they have been susceptible through the air. That is never a good sign against a Mike Leach club, especially a rejuvenated one. I was leaning Fresno State from the get-go, more so after USC was blown out by UCLA and now especially so with Ed Orgeron no longer being the interim coach. The Trojan defense will be able to slow down Derek Carr somewhat, but I also don't have any confidence in their offense. Neither of these clubs really do not do anything special but the Bulls will have the best player on the field in running back Branden Oliver, who has been great this year. Even as San Diego State is very strong against the run, I do not think it will be enough. The Ragin' Cajuns have owned this bowl of late, but they also have not had as strong of an offense as they have had in recent years, although they did lead the Sun Belt in scoring. That said, the Green Wave have an awesome defense, one that I believe will stifle Lafayette just enough to get their first bowl victory since 2002. Ohio should not be in a bowl game while Toledo sits at home, and I don't think they are that much of a football team. They haven't had an impressive win over a good team since beating Marshall...in September. I also think that the Pirates are a much stronger club than are the Bobcats. The Beavers have as exciting of an offense as of any, but they also have not won a game in two months. Even as Boise is playing with an interim coach, which generally has mixed results in a bowl game, it is always hard for a club like Oregon State to turn it around after such a lengthy losing streak. Now if only Utah State still had Chuckie Keaton, this would be a hell of a game in San Diego. I do give them credit for having a very good year with their defense playing quite well, but Jordan Lynch and co. are too good to go out this year on two straight losses. The Terrapins fought hard to get to their first bowl since appearing in this same game back in 2010 and while they should have a decisive homefield advantage, their ravaged ranks at the skill positions will hurt them against a quality Marshall club that is elite offensively (fifth in total offense, sixth in scoring) and also do a good job keeping teams from scoring (25th nationally). It was a big deal that Minnesota had a chance to get to the Big Ten title game as late as November. Of course, it wasn't to be, they are still Minnesota after all. But they have much to be proud of, especially with the health issues coach Jerry Kill endured, causing him to take a leave of absence from the team. This game will be low scoring but Syracuse is little more than mediocre this year. This is a tough game to pick because these clubs are pretty even with strong offenses and solid defenses. I do think the Huskies have the talent edge and even with playing for an interim coach, U-Dub great Marques Tuiasosopo, I like them to win a close one. There may not be a bowl game I feel more confident than this one because it's simple, Rutgers is awful. They needed to beat a crappy South Florida team in their finale after getting smoked by quality Cincinnati and Central Florida teams, and then an awful Connecticut squad. They really struggle offensively, not a good sign against a rock solid Notre Dame defense. Before falling to Louisville at home in a good one, Cincinnati had won six in a row and looked good doing so and had they not fallen in a close one to USF, would have had nine in a row. They have been very solid in Tommy Tuberville's debut season, but I am feeling an upset in the bowl game. I like how their offense has looked in the past month and a half, when they went 5-1 to close the year, and I think a decisively UNC crowd will help tip it to the Heels. I feel like folks have forgotten the Cardinals. It was easy to do, they were thought to be a dark-horse national title contender but those hopes went away with a close home loss to Central Florida, who then went on to win the AAC. Meanwhile, Teddy Bridgewater has been fantastic since and this is a club hungry to get back some prominence and with a Canes club that has floundered since the blowout loss to Florida State being their matchup, I like the Cards. They may be seven win teams but I think this should be a good ballgame. I think folks will be leaning towards Michigan after their near win against Ohio State in the Game, but I like Kansas State. They are just as good defensively, can control the clock with a sound running game and come in winning five of six with a chance to upset Oklahoma. One of many fine clubs in C-USA this year, the Blue Raiders of Middle Tennessee are a fine club without many flaws of note. Rick Stockstill has done a very good job in Murfreesboro and I think he will take out a solid Navy club and get their third bowl victory in program history. When you look at Georgia Tech on paper, you may think they were a club that was better than 7-5. They have been sloppy, a fatal flaw for any team that runs the option, but they do put up plenty of points and play very good defense. Ole Miss can score and slow teams down as well, but I think their unfamiliarity with the option will cause Georgia Tech to get a solid bowl win. As this will be Mack Brown's final game with the Longhorns, could I see the club coming out and pulling off a nice upset in their coach's final game? Sure, we've seen it before like when Michigan upset Florida in the 2008 Capital One Bowl in Lloyd Carr's final game. That said, I don't think Texas is strong enough offensively to match up with the Ducks and strong enough defensively. It's been a tale of two seasons for the Red Raiders in Kliff Kingsbury's first season. They started 7-0 and were ranked tenth when they lost a good one in Norman and then got blown out each of their final four games after that. Now do you think that they can turn it around to defeat an Arizona State team that, despite being dominated at home in the Pac-12 Championship, is pretty good? Neither do I. Any time you put together a pair of the top running backs in the country, like we have here with Arizona's Ka'Deem Carey and BC's Andre Williams, you know it's going to be a grinder. But Arizona's offense does pack plenty of pop while the Eagles are much more methodical. A better defense for the Wildcats will be the difference. This has not been a banner year for the Hokies as it's been rather topsy-turvy for them with the blowout loss to Alabama, then a six game winning streak that was capped by a stretch of three losses in five games to close out the year. Meanwhile, the Bruins are coming off one of their top performances of the year and have found a groove offensively. UCLA wins it comfortably. The Owls have had a great season and that carried them to a C-USA Championship won in impressive fashion over Marshall; it is only Rice's second conference championship since 1957. The Bulldogs had to uncork a couple close victories to end the season just to get to a bowl and while they are very good defensively, I don't think it's enough to carry them past this fine Rice team. What a year it has been for David Cutcliffe and the Duke Blue Devils. In the seven years before Cutcliffe took over, Duke won 13 games. Now they've capped off one of their finest seasons with a bid in a high profile bowl, so it is a shame they face a team with superior talent and a guy like Johnny Manziel that is hungry to (likely) end his career with a bang. The Huskers have been all over the place as the heat has increased on Bo Pelini this season, and thus a lot of folks are going with Georgia. But I'm not that sold on Georgia without Aaron Murray and I think Pelini will rally his troops to finish strong. Remember when New Year's bowls were prestigious and carried some weight to it? Well, then there's this. That is not to take anything away from these two programs, as Dan McCarney and Bobby Hauck did great work this year to lead their teams to their first bowls since 2004 and 2000, respectively. I think the Mean Green have the advantage with an awesome defense and what should be a home crowd. Had Ohio State won the B1G Championship, Wisconsin may have had a solid shot to get a BCS at-large bid, but their loss to Penn State negated that. I do think the Badgers are a better club than they showed in that game, but I also think Carolina is a stronger club, particularly with how well the team has looked with Connor Shaw under center. I will say that I was very wrong on the Hawkeyes before the year, predicting them to finish last in the Legends division and not going to a bowl, so let's get ignore that if we could. Both team have very stout defenses but I think Iowa's offense, which has struggled at times this year, will struggle to move the ball on LSU. Not only is this going to be a classic smashmouth battle, but I also think this is a very even matchup between two very good teams. Both play very physically, run the ball very well and are strong defensively. That said, I think that the Spartans' defense is so good, they can just about shut down Stanford just enough to win their first Rose Bowl since 1988. Boy, did Central Florida have to sweat out some tight games down the stretch with near-misses in four of their final five conference games against less than stellar competition in Houston, Temple, South Florida and SMU. I do think they are a very good club with a pair of talented players offensively with running back Storm Johnson and quarterback Blake Bortles and George O'Leary has done a tremendous job in Orlando. That said, they will be a little over-matched against Baylor. Bob Stoops does have a reputation of winning big games, hence the nickname "Big Game Bob" (which I guess is better than "Baghdad Bob") but he has only won one BCS game since winning the 2002 Rose Bowl, with that lone victory being over an outgunned UConn team in 2011. And while they closed well this year, I don't think they are as good as Alabama, particularly an Alabama team that is angry they blew their shot to get to Pasadena and now has the Nick Saban rumors behind them. For me, this may be the best bowl game of the slate and also one of the toughest to pick as I think these two teams are pretty evenly matched. They can put up bundles of points in a hurry but they also have strong defenses, better than the numbers show, that can keep opposing offenses out of the end zone. I am a little worried about how lame the Cowboys looked in their home loss to Oklahoma, not getting their act together until very late, plus I do think Mizzou has a key edge at quarterback. The calls that the Buckeyes are overrated have strengthened with their loss in the B1G Championship, but people just want to hate Urban Meyer and would call them overrated regardless. I think they're a very good football team that have an excellent offense, one of the elite in the country, as well as a stout defense. Meanwhile, Clemson is a team that has really struggled against the top teams they have faced save for the opener against Georgia. Give me OSU. I think if you are looking for an under the radar bowl game this winter, I would suggest this one between a couple of eight win teams. I could see both teams winning but I do lean more towards the Commodores because I think they are more battle tested even as they have only beaten one team above .500, and they come in winning four in a row. Plus, James Franklin's club is strong enough defensively to slow down what can be a high-powered Houston attack. The Red Wolves were good enough to get another coach hired for a better job, Bryan Harsin makes the third in three years as he is headed to Boise State, but this Arkansas State club is not as good as it was these past two seasons. Meanwhile, the Cardinals are very fun to watch with how solid their offense is and I think thhey will put together a convincing win in the final non-BCS game of the year. 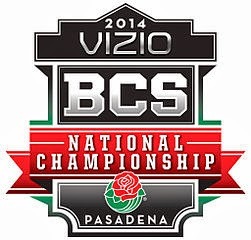 Every BCS Championship Game is fascinating for its own reasons, and this one has a number of intriguing storylines. You have got a Florida State team looking like it did during the finest years of Bobby Bowden, featuring an awesome Heisman-winning quarterback in Jameis Winston, and loads of talent on both sides of the ball. They have dominated just about everybody they have played (save for that random Boston College game). Meanwhile, Auburn has shocked everybody with how they have rebounded from their disastrous 2012 by looking like a team of destiny with those miraculous wins over Georgia and Alabama. 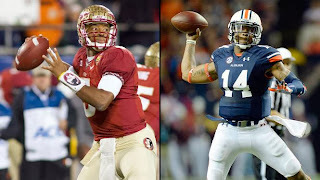 While I do see the urge to climb further aboard the Auburn bandwagon, I do think that they will run out of luck against this loaded Seminole club that are strong enough defensively to slow down the Auburn read option attack of Nick Marshall and Tre Mason and have the ability to really exploit a mediocre Tiger defense.